88 candidates will contest 31 seats! Today is Nomination Day across the country and all political aspirants in the race to capture seats of government in Belmopan have revved up their machines, as more than 80 candidates for the November 4 general elections paid the requisite deposit and were each nominated to contest the elections by six voters from each of the country’s 31 electoral constituencies. The Nomination Day time-honored tradition is that the candidates of the Opposition People’s United Party (PUP) are nominated in the morning, while the UDP candidates, third parties and independents are nominated in the afternoon. 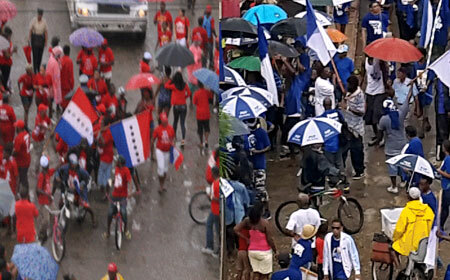 Periodic rains this morning could not dampen the spirits of hundreds of PUP supporters who lined up behind the party’s ten Belize City candidates, as they marched, singing and dancing their way to the nomination center at the Charles Bartlett Hyde Building on Mahogany Street. Fonseca said that November 4 is a day when the people will take back power from one man and give it back to the people. Concerning the UDP’s Dr. Carla Barnett – his opponent in the race to be area representative of the Freetown division, Fonseca commented that he does not think that she has made inroads in his (the Freetown) constituency. “I feel very confident that my relationship with the voters of Freetown over the past fourteen years will prevail, as it has in the last three elections.” he said. As 3:00 p.m. approached, the massive sea of red that began moving off from in front of the UDP headquarters at the foot of the BelChina Bridge, was finally stretched out along the length of Mahogany Street from its junction at Central American Boulevard. The UDP, with its considerable war chest, took a page from the book of the September Carnival Road March, as each candidate had a float, packed with supporters and music, marching bands, and all the necessary paraphernalia, flexing the muscle of its incumbency. Twenty-five candidates of the Belize Progressive Party, Belize’s newest political party, were also nominated today, although there was no fanfare or huge crowds with them, as was reported with the two main political parties, the UDP and the PUP. Patrick Rogers, the party leader, said, however, that there were difficulties registering some of their candidates. He said that some of the individuals who were supposed to come with the candidates to nominate them, between 1:00 and 2:30 p.m., got intimidated and did not show up, which created a problem. Rogers said that they had to scramble to find people to nominate the candidates, but in the end, they were successful, adding that he was elated and excited to be on the ballots, because he now has a chance to change and improve governance in the country, and take the country forward if the people vote him into office. “I am running for labor and the working class people,” said Rogers. Among the candidates of his party who were nominated were Jihad Nedal McLaren and Elizabeth Dena. Nedal McLaren said that the party is running for change. Both major parties have served for 17 years and all they have to show is a debt of billions of dollars each and the country is in the state it is in, he said. Both parties do nothing except borrow, he added, while the BPP brings pride, honor, and integrity to the table. Elizabeth Dena said that she is elated to be nominated and is running on the platform of education. She strongly believes that education is the key for development and believes in an educated public. In Orange Walk North, former UDP city council candidate and beauty queen, Samantha Carlos, has thrown hat in the ring to challenge the incumbent, Gaspar Vega.